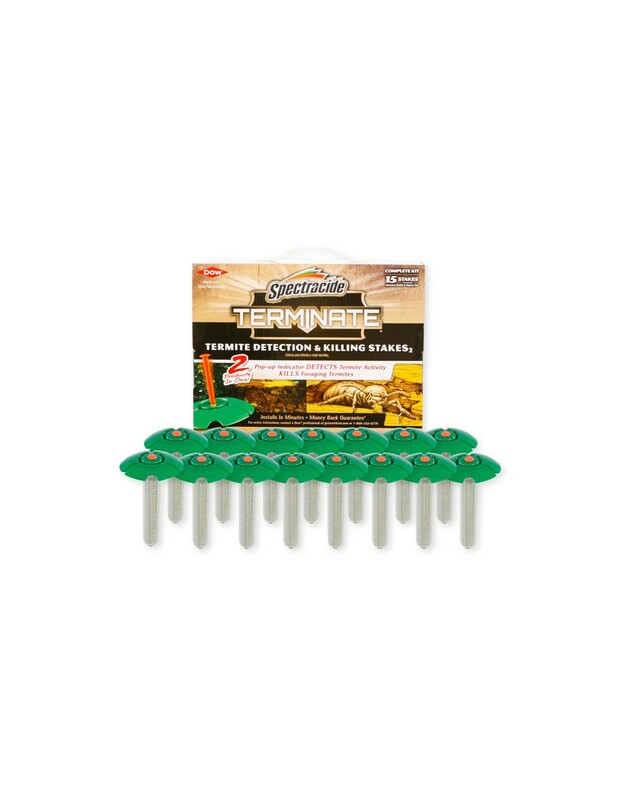 Spectracide Termite Detection and Killing Stakes can be installed in minutes to help detect and kill termites. Kills the following pests: Subterranean termites, the most common termite found in the United States, which live in colonies in the soil. 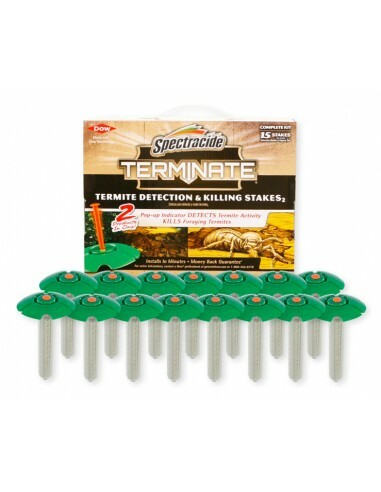 Simply install Spectracide Termite Detection and Killing Stakes around the outer perimeter of the home or building. A handy soil auger installation tool is included. Spacing should be every 10 - 15 feet and approximately 3 feet out from the outer wall. When the pop-up termite indicator triggers, replace the killing stake with a new one. Install around homes, sheds, decks, or any area where termites are found. Not recommended as sole protection against termites. 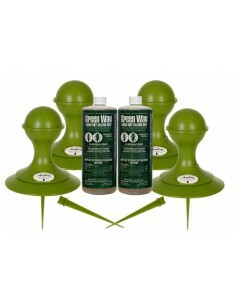 For active infestations, a remedial treatment and a professional inspection are recommended. Determine the number of stakes you need - The number of stakes needed is determined by the distance around the outside of your house. To estimate, use the square footage of your home excluding your garage, attached decks, patios and porches. Home designs vary, but if you know the approximate square footage of your home, the chart will help you choose the number of stakes you need. Prepare drawing of your house - Using the enclosed graph paper, make a drawing of the outside of your house. Note areas on the drawing such as doors, bushes, chimneys, etc., that will help you locate the stakes during the inspection process. Look for areas that are likely to support termite activity and note them on your drawing. These might include areas that retain moisture around downspouts, spigots, air conditioner lines and low areas with poor drainage. The interactive CD-ROM will also lead you through the process. Install the stakes around the house - Using the auger, dig holes 2 to 3 feet away from the Foundation and no more than 10 feet apart. Insert the stakes with locator shield in the holes. Place stakes closer together in 'termite critical' areas. 3 - Note the date, the location and the additional stakes on your drawing. 4 - All stakes must be replaced or removed every 12 months. Be sure to wash your hands thoroughly after completing the inspection. Do not use more than 20 stakes per home.